Giving an infant their daily bath can be a rewarding and challenging task. There’s always the risk of injury due to accidents, such as your baby sliding out of your hands. But with the best baby bath tubs, it becomes less of a challenge and more of a pleasure for parents. Many of the baby-friendly tubs I’ve included here have safety features that reduce the risk of accidents. Proper bathing procedures are still a must to ensure your baby’s safety while in the water. After extensive research and personal experience, here’s my list of the best bathtubs for babies that parents will love. This tub has several easy-to-use features that make it suitable for use from birth to 25 pounds. Parents who are looking for a tub that will last their children many years will find it a good buy. This tub has a one-piece design that evokes the simplicity of classic baby bathtubs yet offers the features of modern ones. When transitioning from infant to toddler, it’s as simple as removing certain features like the mesh sling. There is no complicated installation involved and no small parts that can become choking hazards. The built-in wash basin is a convenient feature, and it can hold your baby’s toys and supplies like shampoo and soap. The rinsing water can also be placed here so that there’s no need for a spray hose when washing your newborn. The tub itself is deep enough to hold your baby within its depths while holding more water for your toddler’s enjoyment. For an infant, the mesh sling provides a safe and secure place to lie while being bathed. 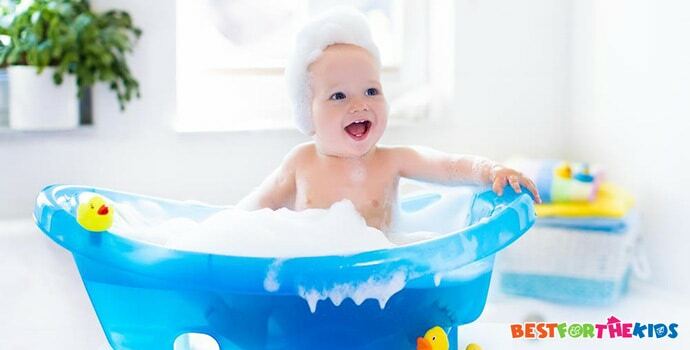 Their head can also be protected by the padded headrest, making bath time more enjoyable for baby. The mesh sling can be washed by hand or in the washing machine. Washing it regularly is a must to remove the buildup of soap residue and dirt on it. The pads are mildew-resistant, so there’s less risk of skin infections caused by the growth of mold or mildew. What's Great About It: This tub is large enough to fit in single and double sinks so you can maintain an ergonomic position while bathing your baby. The bump in the tub prevents your baby’s bum from sliding down, while the straight back allows your toddler to easily play in the water. The Fisher-Price 4-in-1 baby bathtub is one of the few tubs that grow with its user, so to speak, while also providing parents with safety features for their baby’s welfare. There are four stages to the bathtub with each stage corresponding to a specific developmental stage in your baby. In stage 1, a newborn can be placed inside the soft mesh sling, which provides a sense of being cradled in their parent’s arms. This frees up your hands for soaping and rinsing your baby. In stage 2, the mesh sling should be removed so that the baby stopper insert can be placed inside the tub. The insert places your older infant at a gentle recline, while also preventing slips and slides from the soap-and-water mixture in the tub. The insert is made from a soft-foam material to protect your baby’s soft bum. Stage 3 is for older babies that can sit up, but may need help in doing so. 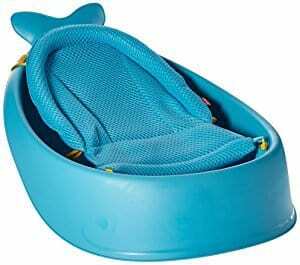 The Sit-Me-Up Support allows your little one to gently recline in the water. Most children at this age are still unsteady sitters, but the support allows them to sit up easily while in the tub. The parent giving the bath should still keep a hand on their older baby since it’s risky to leave them alone in water. In stage 4, all the inserts and slings should be removed so that the bathtub becomes spacious enough for your toddler to sit in. A few toys can also be added to the bath water to make bath time fun. What's Great About It: The strong and sturdy plastic can withstand several years of use, and can be used for all of your children as they come along. The colors will also stay vibrant with correct care. 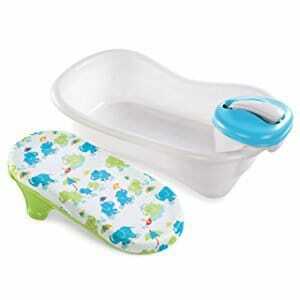 Unlike most of the baby bathtubs here, the Blooming Bath tub provides a soft surface for your baby to take a bath in. The bathing surface consists of two layers – first, the sturdy plastic that keeps the inner material in its form; and second, the soft, comfortable and cuddly inner material that cradles your baby’s delicate body. Instead of hard plastic coming into contact with your baby’s sensitive skin, the soft material caresses and cradles it. When your infant is placed in the tub, they look like they’re surrounded by petals. What's Great About It: Parents who want a cute yet functional alternative to traditional bathtubs for their baby may find this tub to be a great choice. This 3-stage bathtub also has safety features that make bath time more enjoyable for your baby and less stressful for you. During the newborn phase (0-3 months), the soft yet strong sling supports your baby’s body and head, so there’s a reduced risk of drowning in the tub’s shallow water. Since your baby is inside the sling, you don’t have to unnecessarily strain yourself holding your baby in one arm and bathing them with the other. But it’s still important to keep one hand on their body as additional support while the other hand does the cleaning. At stage 2, the full-body support provided by the sling can be converted into a seated support for your baby as they learn to sit on their own. This usually happens between 3 and 6 months of age. Just adjust the sling to its lower position so that it becomes a seat support for unsteady sitters. For stage 3, your baby will probably be a steady sitter as they will be older than 6 months, but adult support may still be necessary. The sling can then be removed from the tub so that there’s more space in it for your independent sitter. What's Great About It: The plastic tub is made of non-toxic materials free of PVC and phthalates. This is an important aspect in choosing the best baby bathtub since these chemicals may adversely affect your baby’s overall health. The tub also has a drain plug and swivel hook for ease in cleaning and storing. 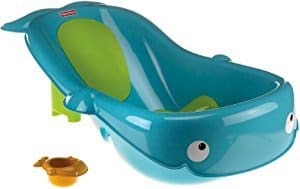 This baby bathtub features three stages which parents can use for their baby from their newborn to toddler years, and can also use it as a water container for water play in their older years. The sling, which is made from a soft yet sturdy material, has a rainforest-themed print and a padded design. The relatively thick padding provides a comfortable surface for your newborn to lie on, while the sling keeps them in a safe position in the tub. This is a common feature in Fisher-Price multistage baby bathtubs because of the added safety it provides. The stopper for stage 2 replaces the sling as your baby grows. 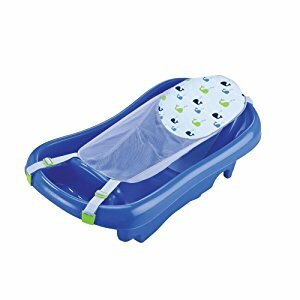 When placed inside the tub, it provides a padded surface for your older baby to recline on while getting their bath and engaging in water play. The non-skid surface inside the tub keeps your baby’s bum in place, even in the soapy water. Stage 3 is used when your child is old enough to sit without assistance, and the stopper can then be removed from the tub. It then becomes a toddler-friendly bathtub, and can be used for water play with a few bath toys inside. What's Great About It: The tub comes with 2 bath toys – an alligator-shaped sifter and a hippo-inspired pouring cup. 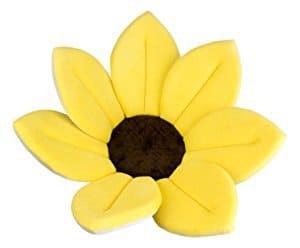 These can also be used for bathing your baby. This whale-inspired baby bathtub has a fun design that will engage your toddler’s imagination. The blue and green colors represent the ocean while the large whale eyes and swishy tail design has whimsy written all over it. The whale’s body is the baby bathtub itself. It’s deep enough for your toddler to play in waist-deep water when they sit inside yet shallow enough for a parent to bathe an infant while standing over the sink. It can fit inside most single and double sinks, making bathing an easy and pleasant task. 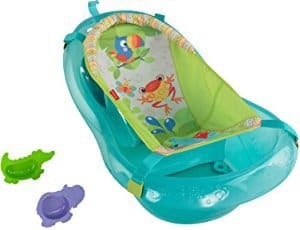 With the infant insert in place, it can be used for babies from newborn to 6 months old with a weight up to 20 pounds. When the insert is removed, it’s a great place for your toddler to take a bath with adult supervision. The tub can hold toddlers up to 25 pounds. What's Great About It: The drain makes easy work of emptying the dirty bath water from the tub. The plastic tub is also easy to clean with a spray hose. Cleaning it with soap is necessary to remove any accumulated grime. The shower unit in the Summer Infant bathtub makes it different from the baby tubs on my list. This is a motorized shower unit that can be installed and removed as needed. When it’s connected to a faucet, it emits a gentle spray that can be used for rinsing your baby or toddler, as well as part of fun water play. This is also a 4-stage baby bathtub, but with a slight difference from the Fisher-Price Sling n Seat tub. For its stage 1 design, it also features a newborn sling inside the tub for cradling your baby. The gentle spray from the portable shower head makes rinsing faster and easier. For stage 2, the sling doesn’t have to be used for your older infant usually 3 months old and up. The shower unit should be placed outside the tub for more effective use, both for wetting and rinsing your baby. During stages 3 and 4 of the tub, the sling should be removed so there’s more room for your toddler to play inside it. The shower unit can still be used for its original purpose, although most parents use it for playtime purposes. What's Great About It: The blue color is unisex even though it’s normally more closely associated with boys. The shower unit, nonetheless, makes it fun for both boys and girls during their toddler years. Keep in mind that buying baby bathtubs should be given time, effort and energy because of the safety risks involved when a wrong choice is made. The best tubs are designed to make bath time as safe as possible, as well as get the task done quickly and easily for parents. According to safety experts, buying the right baby bathtub can be easy when you know what to look for. Safety is always the main concern since a baby can quickly drown in as little as an inch of water. Chemicals like lead, PVC and phthalates shouldn’t be in baby products because of the harmful effects they can have on the human body, especially on an infant’s delicate body. Reliable manufacturers, such as Fisher-Price, are committed to using non-toxic materials in their baby products, from toys to tubs, so these are usually the first choice for parents. Baby bathtubs should fit into standard kitchen sinks or on countertops. Standing over the sink is the safest way to give your baby their bath because an adult can exert more control over their arm and hand movements at this height. There’s also less risk of lower back and leg pain, thanks to the more neutral spine position. Many tubs also feature a removable sling, a crotch post, or side supports. 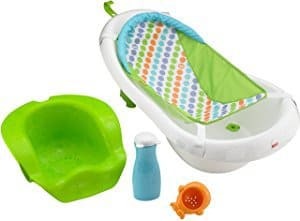 While each one has a specific safety purpose, all of these keep your baby from slipping and sliding while in the tub. The removable sling, for example, cradles your newborn within it so that you don’t have to cradle them in one arm. Many of the baby bathtubs have a thin padded lining and smooth overhanging rim. These features provide an added layer of protection for your baby’s sensitive skin, especially against accidental scrapings when taking them out of the tub. A drain hole with its attached plug makes it easy for you to drain water after bath time instead of tipping it over the sink or ground. It should be easy for you to plug and unplug too. It should be easy to clean accumulated debris, such as soap residue, dead skin cells, and hair. The plastic should withstand gentle scrubbing with a soft brush or a cloth. When not in use, the tub should be placed on a hook, with either a built-in hook or a hole in the rim. Many parents flip over the tub for drying, but it can take up space on a flat surface. Parents should expect that their babies’ first bath time at home will be stressful. Your baby will likely be squirming from the new sensations. You may be anxious about getting it right the first time so that the succeeding baths will be enjoyable for your baby. Prepare all of your baby’s bath supplies within easy reach before giving them a bath. Place the bathtub securely in the sink or at a distance from the edge of the kitchen countertop. Bathe your baby at a regular time and when they’re awake. Check that they’re relatively calm and well, with no fever or colic. Make the first baths quick so that they become accustomed to the lukewarm water. Fill the tub with 2-3 inches of lukewarm water before slowly lowering your baby into it. Always check that the water is lukewarm. Babies can easily get third-degree burns so checking the water temperature is a must. Safety experts recommend setting the water heater at 120°F. Placing your baby, even for a minute, in water hotter than 120°F can result in third-degree burns. Most importantly, never leave your baby alone in the tub no matter how old they are, even with a sling in place. Your baby can squirm while in the tub making it easy for accidents to happen. Parents obviously want to keep their babies looking, feeling and smelling good, so giving them daily baths is a vital activity. When your child enjoys bath time, there will be no more fights about getting in the tub. Setting a good standard from the start will result in a healthy attitude towards getting clean.